Elegant decorative object and beautiful eye-catcher. The modern way of giving roses. So realistic that you want to smell the flowers. The new trend in floral presents: Twelve life-like, red roses in a stylish box. Stunningly beautiful flowers without needing specialist care. Red roses have always been a symbol of love, affection and appreciation. Now, the charming language of flowers is again highly topical – with a completely new look in flower arrangements. 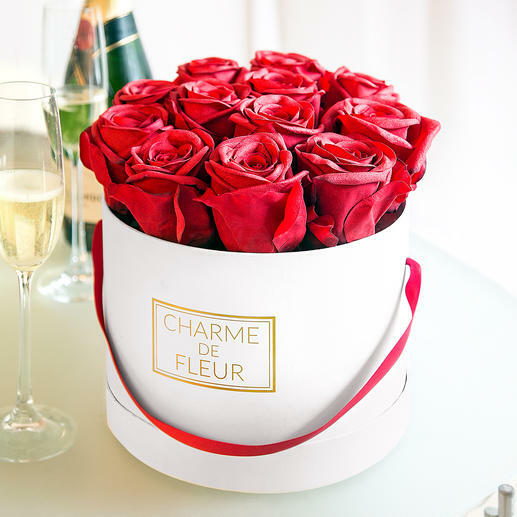 Like an elegant hatbox filled with a magnificent bouquet of roses: With a bright red satin ribbon and gold-shimmering “Charme de Fleur” lettering. Makes a fantastic impact as a present. Later, the perfect decoration for a sideboard, chest of drawers, shelf – or romantic dinners, holiday and wedding tables. Instead of simply being tied as a bouquet, the 12 flowers peek up out of the hatbox, upright and close to one another. Only the heads (approx. 6cm (2.4") in diameter) are visible and emerge as a sea of flowers. A very high-quality arrangement in the popular simplistic, modern florist’s style: Romantic and elegant – but not artificially composed. The slightly iridescent, deep red tone and the fine arrangement of the heads look amazingly real. Each flower consists of 28 textile petals and always differs slightly – as if it were grown naturally. Unlike real roses, these remain beautiful for longer and are easy to clean by brushing or blowing. The box, made of matt white cardboard, with 12 roses measures approx. 21cm (8.3") in diameter, approx. 21.5cm (8.5") H. Weight: Approx. 480g (16.9 oz).